Healthy body tends to have a better future life. In today’s world children have become so delicate that when he or she eats an ice-cream or any cold stuffs, on the same day the child suffers from cold and fever. When the child falls sick , their whole day routine get disturbed and mood at home itself becomes depressed and unnecessary tension. Children are our life. Taking care of our children is our duty. Since the habit that we teach them or make them to follow will be followed by them permanently in their life period we need to develop healthy children by giving good nutritious food, proper sleep and some healthy tips. Home remedies are the best medicines which can be given to the child. These remedies has the herbal content to deal with health problem. The minor cold, cough, fever can be thrown out by these simple remedies. I have seen many parents, when their child falls sick due to minor cold or fever, giving high dose of medicines, which are not at all good for the children. Rather it is really harmful to the tender body. Repeated sickness occurs because the immunity power is taken out of the body and weak body gets hunted by powerful diseases. Now it’s the time to all the parents to take the action and the sensible decision to fix a healthy lifestyle for their children. 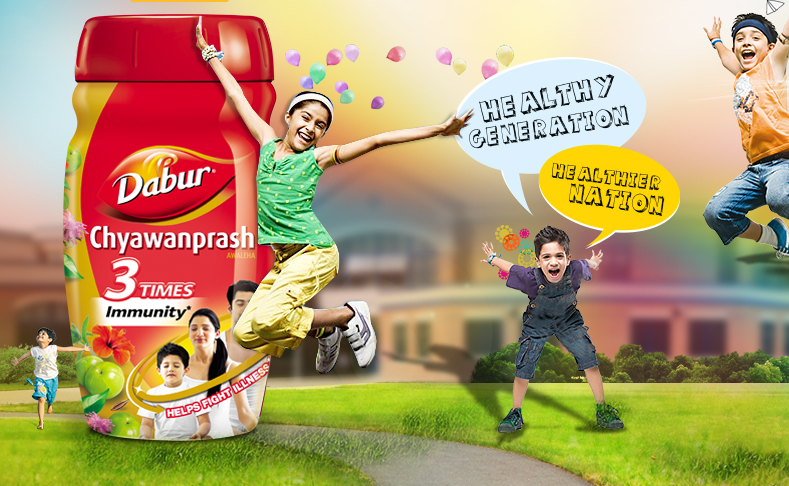 Dabur Chyawanprash is one of the best home medicines which can make your child more healthy. Chyawanprash is made up of natural herbs and it helps to fight with any diseases and of course increases the body immunity. Here are some more home remedies which can be tried in the daily routine. Glass full of milk with a pinch of turmeric can help the body to fight from any allergies. Soak 1 tsp of fenugreek seeds in the water for 30 minutes and then mix it in 2 tbsp. of thick yogurt. Eating this the indigestion problem can be solved. When your child has the dry cough, give him onion and jaggery to eat. This can immediate stop the dry cough. Consuming fresh fruit and vegetables in our daily diet can help us to balance our nutrients in our body. Make them active in physical activity. You too can participate with them to boost their body and mind. Teach them healthy habits like covering the mouth while sneezing or coughing. Not to eat the food without washing their hands. Lastly here comes Dabur chyawanprash which boost the body immunity. Giving 1 tea spoon full of chyawanprash everyday can them to increase their body immunity by 3 times. Do share if you have any home remedies you follow to keep your child healthy. Have a healthy and happy family !! Good post... Thanks for sharing! !